This triple gusset Classic Briefbag is hand crafted from individually hand stained vegetable tanned leather. Made in the Tuscany region of Italy. Its modern, practical design features computer compatibility, steel frame reinforcement, polished nickel hardware, suede leather lining, and raw edges. 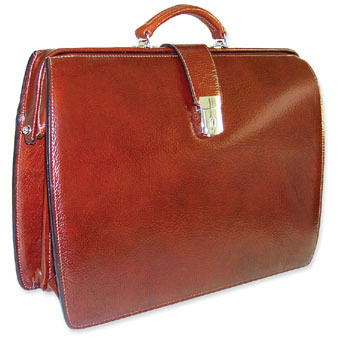 The briefcase is available in black, cherry, and cognac. On the Outside, the flap over buckle keeps the case secure. >>> Jack Georges has a new promotion starting ..